First, here is the good news: Up till now, you have been experiencing a variety of strange symptoms, and you’ve wondered what was wrong. Now the uncertainty and not knowing are over. Your doctors have diagnosed you with End-Stage Renal Disease (ESRD)—chronic kidney failure. At least now you know what you’re dealing with. And your doctors have treatments to help you. As those treatments start to work, you will start to feel better. Still, as a new dialysis patient, you probably have questions: What is dialysis like? How will I handle it? This article may help answer those questions. Healthy kidneys perform many important functions. Here are just two of them. Our metabolism of the food we eat creates various waste products, such as urea. Other wastes are generated by the normal breakdown of tissue. The kidneys filter these wastes from our blood, excreting them in our urine. The kidneys also help to maintain proper fluid balance in our bodies. If we consume too much liquid, our kidneys will remove the excess fluid and excrete it too. When your kidneys fail, they can no longer perform these important functions. Dangerous waste products and excess fluid can build up in your body. Dialysis is a process that removes these waste products and excess fluid from your body, doing artificially what your kidneys can no longer do. Today, you have several types of dialysis to choose from. Working with your nephrologist and your social worker, you can choose a type of dialysis that is most appropriate for your health needs and for your lifestyle. 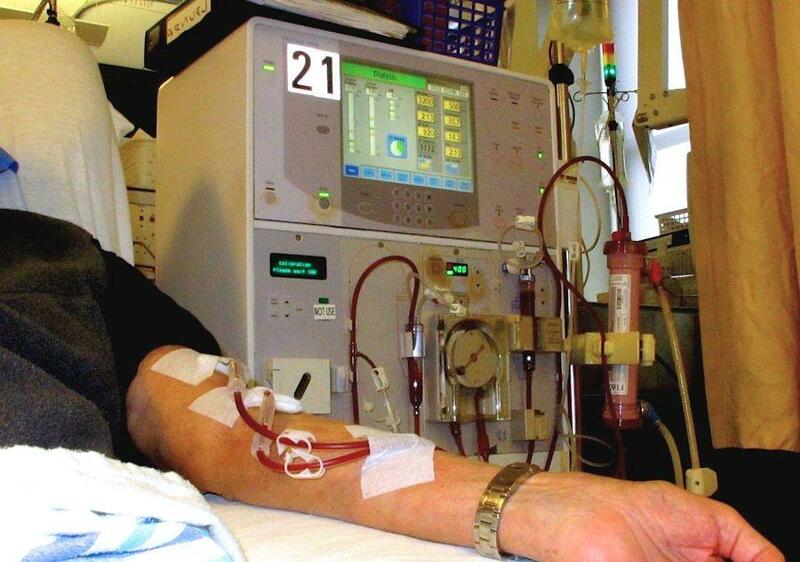 Hemodialysis is the oldest type of dialysis and is still the type most commonly used. In hemodialysis, a machine (like the one in the picture near the start of this article) uses a pump to circulate your blood. Arterial blood comes out through your access and passes through a tube. Then your blood enters a device called a dialyzer or “artificial kidney” which is designed to filter wastes and extra fluid from your blood. A modern hollow-fiber dialyzer is a cylindrical device containing a bundle of hollow fibers. (In the picture near the start of this article, there is a dialyzer attached to the right side of the hemodialysis machine.) Your blood passes through the fibers, and a special fluid called dialysate circulates around the fibers. Waste and excess fluid pass out of your blood and into the dialysate. Then your blood returns from the dialyzer through another tube. Finally, your blood passes through your access back into your bloodstream. This process continues until your blood is sufficiently cleared of waste and extra fluid. To keep your blood from clotting during this process, an anticoagulant drug called heparin is added at the start of hemodialysis and also midway through the process. Typically, hemodialysis takes several hours and is performed several times per week. However, your nephrologist may prescribe a different treatment schedule that takes into account your special health needs. There are several varieties of hemodialysis. In-center hemodialysis is the traditional variety of hemodialysis. You visit a dialysis center several times per week, where you receive hemodialysis treatment from a trained medical team. Your nephrologist is a specialist in kidney function, kidney diseases, and medical treatments for kidney disease. Your dialysis technician performs your dialysis treatment. He or she is the team member you will be interacting with most often. He or she works under the supervision of your dialysis nurse. Both of them can give you advice on how to care for your dialysis access and how to care for yourself between dialysis treatments. Your dietitian creates a diet plan for you, based on your health, the results of your medical tests, and the type of dialysis you are doing. Finally, your social worker helps you deal with the changes to your life and lifestyle that your medical treatment may bring. He or she can also help locate sources of financial assistance for you. Even if you are performing home dialysis, you may still visit a dialysis center—perhaps once per month—to review your laboratory test results and health status. With in-center self-care hemodialysis, you and your partner (if you have one) are trained to perform part or all of your in-center hemodialysis treatment yourselves. Nocturnal hemodialysis is performed overnight while you sleep, either at a dialysis center or at home. Home dialysis options include home hemodialysis and peritoneal dialysis. For home hemodialysis, hemodialysis machines are available that are simpler and easier for you to use than the ones in dialysis centers. For example, with the NxStage System One a single disposable drop-in cartridge contains the dialyzer and tubing set. The machine is also compact, only 15x15x18 inches in diameter. In peritoneal dialysis, your body’s own peritoneum (abdominal lining) is used to filter waste from your blood, instead of the dialyzer device used in hemodialysis. You open your access in your abdomen and fill your abdominal cavity with dialysate. Blood vessels in your peritoneum circulate blood, whose wastes pass through the peritoneum into the dialysate. Then the used dialysate is removed through the access. There are two types of peritoneal dialysis: Continuous ambulatory peritoneal dialysis (CAPD) and continuous cycling peritoneal dialysis (CCPD). In Continuous ambulatory peritoneal dialysis (CAPD), you fill your abdominal cavity manually and empty it manually after four to six hours have elapsed. This period of elapsed time is called the dwell time. During the dwell time, you can go about your usual routine. Each fluid exchange takes about 30 minutes to perform. With continuous cycling peritoneal dialysis (CCPD)—also known as automated peritoneal dialysis (APD)—dialysate fluid exchanges are done by a cycler machine at night while you sleep. Typically three to five exchanges are done overnight. Your nephrologist may also have you do one additional exchange manually during the daytime. Note that not all dialysis centers offer all these kinds of dialysis. You need to find a dialysis center that offers the kind of dialysis you prefer. See section 25. Your nephrologist will prescribe a dialysis schedule for you that is based on the type of dialysis you are doing and your health needs. Here is how a typical in-center hemodialysis session takes place. In preparation for your hemodialysis treatment, you wear comfortable clothing. Sometimes something spills on your clothing during your treatment, so you don’t wear anything you would especially mind getting stained. Just before and just after each hemodialysis treatment, you weigh yourself on a scale. Your weight just after your previous treatment is called your dry weight; it represents your weight just after the hemodialysis treatment removed excess fluid. The difference between your weight now and your previous dry weight yields the amount of weight you gained since your previous treatment. Most of that weight gain is likely to be excess fluid buildup. Your dialysis technician sets the dialysis machine to remove most of that fluid from your body. Next, your dialysis technician escorts you to a dialysis chair next to a hemodialysis machine. You sit down and make yourself comfortable. The nurse takes your vital signs and listens to your lungs for sounds of congestion. The dialysis technician checks your access to be sure it is working properly. If you have been experiencing any health problems, you should tell them. Next, the technician connects your dialysis access to the tubes coming out of the dialyzer. And then he or she starts the hemodialysis machine. It pumps your blood continuously, through the dialyzer and back to your blood stream until the dialyzer has sufficiently cleaned your blood of wastes. This typically takes several hours. Your dialysis technician will monitor the machine every half hour or so, recording your progress. While this is taking place, you can do whatever you wish to pass the time, as long as it doesn’t impair your hemodialysis access or interfere with the operation of the dialysis center. You may nap, watch TV (available in most dialysis centers), read a book, use a laptop computer (wi-fi is available in some dialysis centers), or even do some simple exercises with your free limbs. If at any time you don’t feel well or you notice anything out of the ordinary, alert your nurse or dialysis technician. When the hemodialysis treatment is completed, the machine alerts the dialysis technician. He or she sets the machine to return any remaining blood back to your bloodstream. Then he or she disconnects your access from the dialyzer. The nurse checks your vital signs once more. You weigh yourself again to establish your new dry weight. (The difference between your new dry weight and your weight before the hemodialysis treatment began is the weight of fluid that was removed by the treatment.) Then the dialysis session is over, and you may leave the dialysis center.